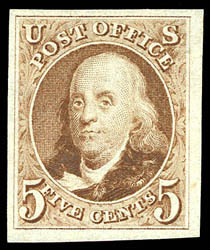 1847 (1875 Reproduction), 5¢ red brown, without gum as issued, ample to huge margins, strong vivid color, Very Fine to Extremely Fine; with 2014 P.S.E. Graded certificate (VF-XF 85, SMQ $950). A link back to Sale 75 - Lot 628, along with its description, will be appended to your message.